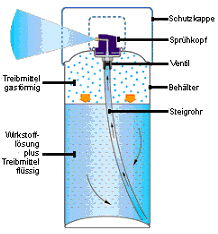 Inside the aerosol can, there is a mixture of pressurized solids, propellants and solvents. By pressing the spray nozzle, this pressure and thus the contents are suddenly released. In the same moment, the propellant atomizes within a split second. Every single drop bursts into many midget droplets. With no other technique you'll achieve a comparable fineness of droplets. The active substance (paint) will be applied - more economic, more even, smoother and more dry. Here you'll find the corresponding spot.